What's needed for the restoration of river systems is all the scientific research that's being done as well as great encouragement for people to care for local waterways. One suggestion is to tell river stories from the present and the past, e.g. stories from indigenous communities and from the early days of white settlement when cotton growing, sugar cane farms and cattle stations spread out along the river. People may become more aware, more engaged and perhaps more motivated to take action to protect the river environs. Talking to people I meet on the trail teaches me so much about the river and its history. We discuss the birds we've seen, the experiences of flood times, how tough it was for the early settlers in clearing the luscious rainforest for farmland and more generally, about the threat of encroaching development. And we work together to care for the precious bushland. Each day I pull up a number of noxious weeds but with the recent fantastic rain, the weeds are growing faster and taller than my ability to rip them up them; it seems impossible to combat their spread. 'Unless human communities begin to adapt to natural cycles and coexist with aquatic communities, those natural communities will disappear and the ecological work they perform will be lost.' (202). They call for an ethic of stewardship which respects 'the beauty and mystery' of the natural world while at the same time demanding from governments a more aware, community-embedded active rivercare program. 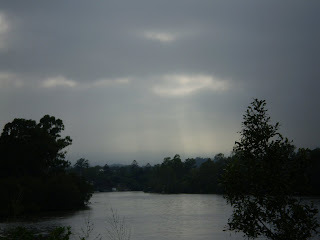 One of the case sudies from Rivers of Life is the Brisbane River and its deteriorating health. Postel and Richter point to the extent of land clearing where now only 14 percent of the whole river catchment area where most people live 'remains uncleared' (133). They document a litany of river impacts that have severely affected the river flow, from construction of dams to changes in waterway vegetation which interferes with 'shading and temperature controls' raising the likelihood of 'algal blooms and lowering dissolved oxygen levels.' (135, citing Arthington et al, 2000). The list of concerns continues with the loss of biodiversity and subsequent loss of habitat for bird, animal and fish species, including the platypus. In the end such conflict is played out between humans and nature where nature's voice is rarely heard. At the moment the Butcher Bird is sitting on the verandah singing the most glorious chorus and sounding, on occasion, like the Magpie, the Kookaburra and of course, itself. I love that. The very melodic refrain of the Butcher Bird reminds me how important it is to value local river systems and trees and get involved in that complicated work of the ecosystem of which, we humans too, are part. Arthington AH et al, 2000, Environmental Flow Requirements of the Brisbane River Downstream from Wivenhoe Dam, Brisbane, Queensland: South East Queensland Water Corporation, and Centre for Catchment and In-Stream Research of Griffith University. Postel S and B Richter, 2003, Rivers For Life: Managing Water for People and Nature, Washington, DC: Island Press.